This drinking game is a huge amount of fun to play with both family and friends. After players choose their favorite color mini Six-Pack, teams face off in a drunken roundabout fashion in hopes to be the first person to fill up their Six-Pack. ​The game comes with little itty-bitty miniature beer bottles that are awarded to teams who win various different drinking games throughout play. ​The first team to fill up their 6-pack with beer bottles is crowned the winner! After setting up the game board, coaster and spinning center bottle. Get drinks ready and decide who is playing (choose 2-person teams if needed) and have each team choose one of the colored mini 6-packs. ​Have each team stand around the game to see who goes first. Someone spins the center beer bottle and whomever it lands on will begin first. The first player begins by rolling the die. The number you roll decides how many spaces you get to move your empty Six-Pack. When a player lands on a space, the space they landed on will determine what tipsy related activity they will participate in. Once the player and/or activity is finished, award the victor with their winnings and pass the die to the next player in rotation. House rules decide whether you would like to rotate turns clockwise or counter-clockwise. Continue this until a team is awarded all 6 bottles filling up their empty beer pack, or until everyone is a drunken mess and can't continue! Each new rule lasts the remainder of the game or until another team passes the Start space and uses their rule to cancel one out. Please note, the rules should apply to everyone participating and should not be used to pick on another team. Don't be a mean drunk! Need help making a rule? Check out our random rule generators by clicking here! Pour with caution though, because you may end up having to drink this entire thing at some point during the game. Careful not to land on this space. If you're too drunk to catch the pun here, you should probably sit out and drink some water. The player or team must decide whether the next card drawn from the top of the deck will be either Higher or Lower than the next card shown. Reveal the card to the table to determine if the team was correct. If the first team is correct, it is now up to the next team in rotation to guess whether the next card shown will be higher or lower. Keep going around in rotation until someone guesses incorrectly. If you guess incorrectly then that player must take a drink. Spin the beer bottle spinner in the center of the game board to decide who has to drink. From now on, anytime a 3 is rolled on the die or revealed from the deck of playing cards. Your team drinks! If a 3-man lands on the 3-man space again, they are no longer the 3-man anymore. If another player lands on the the 3-man space, this new player takes over as the 3-man going forward. The "Make-a-Rule" space cannot be used to cancel 3-man, however, it may be used to change the number from 3 to 4 for example. Get creative! Simple enough! Land here and if another team has a bottle you can get your grimy hands on. Steal that sucker and put it in your six-pack! Land on King's Cup and your team gets to choose a card from the deck of regular playing cards. Depending on what is revealed, your team must follow the traditional King's Cup rule accordingly. Go around the board drawing cards until everyone has drawn a card before continuing. 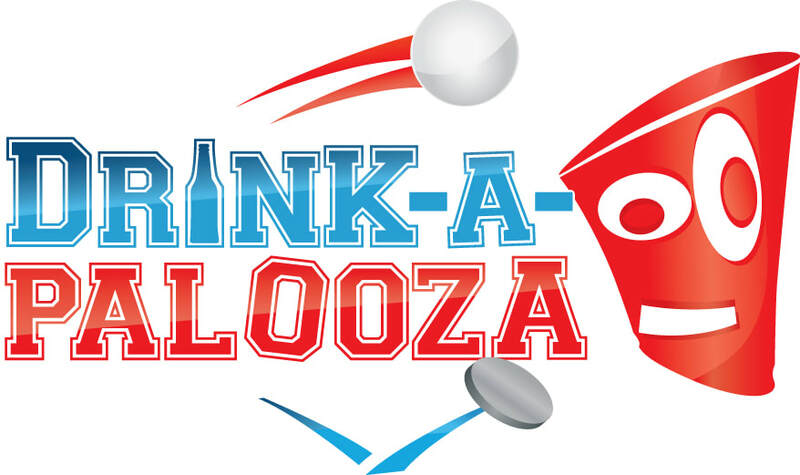 If you're having trouble remembering the King's Cup rules, simply refer to the quick-reference printed on the Drink-a-palooza game board. Uh oh, it's time. Landing on the Drink Cup space means you must take whatever is in the center cup. Then slam it before you can take your next turn. Place your bets! Before revealing a card from the deck of regular playing cards. Decide how many sips will be taken as the outcome. If you reveal a card that is the same color as the space you landed on. Your team gets to choose another team to drink the sips you have bet. If the card color doesn't match your landed space, drink up buttercup! You get 3 attempts to roll a 1 when it is your turn while in the slammer. After 3 turns if you are still in the pokey, you may get out of jail and advance the number of spaces you last rolled. Feeling generous? Or are you just thirsty? Whoever lands here starts your traditional Waterfall drinking exercise by starting to drink at the same time. Cups up and heads back all at the same time until the person next to you decides they no longer want to drink. When landing on the bottle space labeled Beer Pong, chosen teams will face off in hopes that they will win a Bottle to put in their 6-Pack. The team that landed will participate and gets to choose another team by spinning the bottle in the center. The first team to bounce or shoot their ping pong ball into the center cup is declared the winner. Award this booze buddy their bottle! Losers must drink the center cup and pour some of their beverage in when finished. Be sure to establish house rules regarding shooting distance and whether or not you can bounce. ​Generally 6 ft. away from the cup is fair grounds. When landing on the bottled space labeled Quarters, chosen teams will face off to try and win a miniature beer bottle for their empty pack. The team who landed in this space gets to participate and must spin the bottle in the middle to choose their opponents. ​The first team to get their quarter into the center cup is declared the winner! Give these champs the beer bottle they deserve. ​Losers must drink the center cup and pour some of their beverage in when finished. When a team lands on this space, everyone playing gets a chance to play Flip Cup. Make sure everyone is ready with their cups before you begin. ​The first player or team to successfully flip their cup is declared the winner and is rewarded a mini beer bottle for their 6-Pack. Losing players must take a drink of their alcoholic beverage. The last team to successfully flip their cup has to drink the community cup in the center then pour some of their own drink back in when finished.